Mercury’s orbit seen against the background of springtime evening stars. 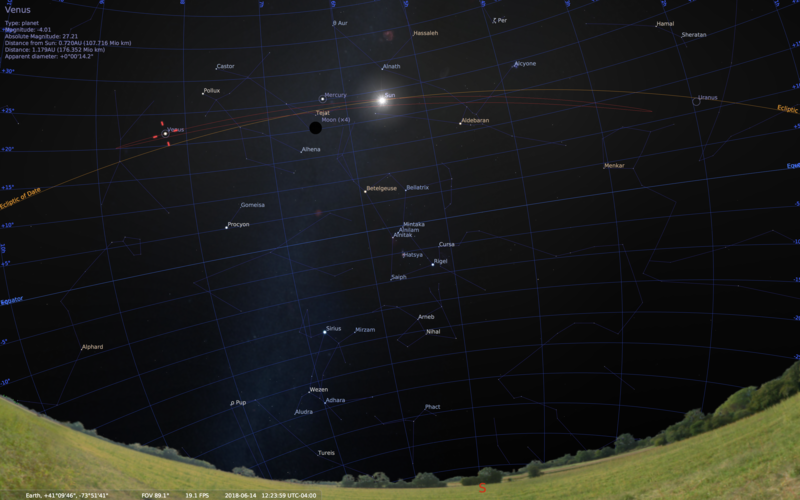 Stellarium view. At night, you can use stars to help visualize the size of the inner planet’s orbits. To visualize that in the night sky (in springtime) Mercury’s orbit spans from Aldebaran to Pollux. Astronomers use “hours” to measure east to west sky movement. Mercury’s orbit spans 3.5 hours. The orbit of Venus seen against the background of springtime evening stars. 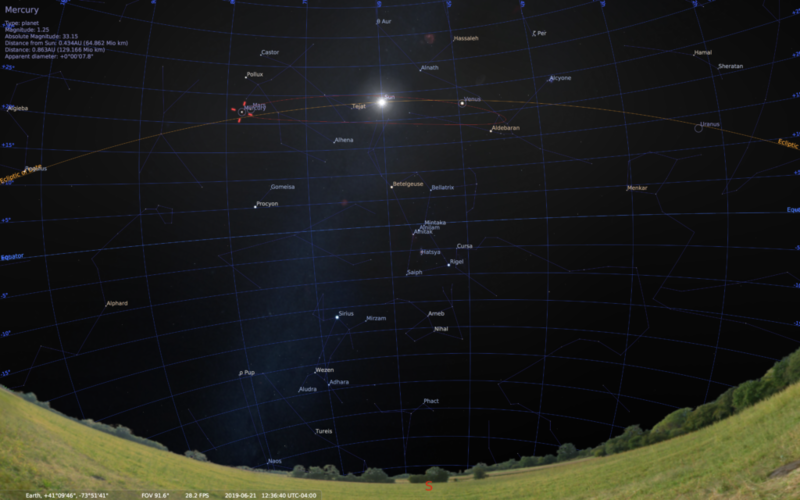 Stellarium view. Venus’s orbit spans 7 hours of the sky. 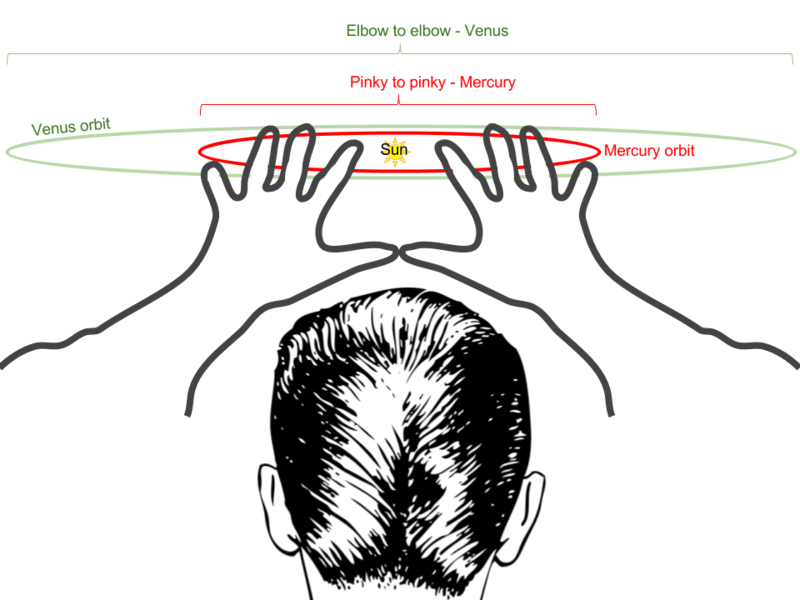 To visualize that in the night sky (in springtime) Venus’s orbit spans from Regulus to the Pleiades (the seven sisters). We answered the question: If you could see the orbit of Venus would it fill the whole sky? The answer is no, it would fill only part of the sky. We learned a Physical Astronomy technique for how to see the orbits of the two inner planets Mercury and Venus. Nicely done. Perhaps you could define an ‘orbit’ for the younger children? Also, have the’details’ fields fill in automatically for fans who’ve previously posted. Probably would increase the number of comments? Keep those posts coming! Thanks for the feedback. That’s one of the hardest things about teaching these concepts to a wide range of ages – it’s also one of the most challenging and fun aspects too. Orbit means flying around in a “circle” around something bigger. I’ll look into a way to avoid making you type your email each time – that’s a good idea! Image of venus orbit is shown a hour or two (ie 2-4 sun-travel weeks) off, compared to stellar signposts noted….shown extending from Cancer out toward Aries). I get that you’re trying to use the same sun-point, but it’s confusing to not find Regulus in the image. Aha! Good catch. I will regenerate a more accurate image that matches the text of the article. Thanks Jim!